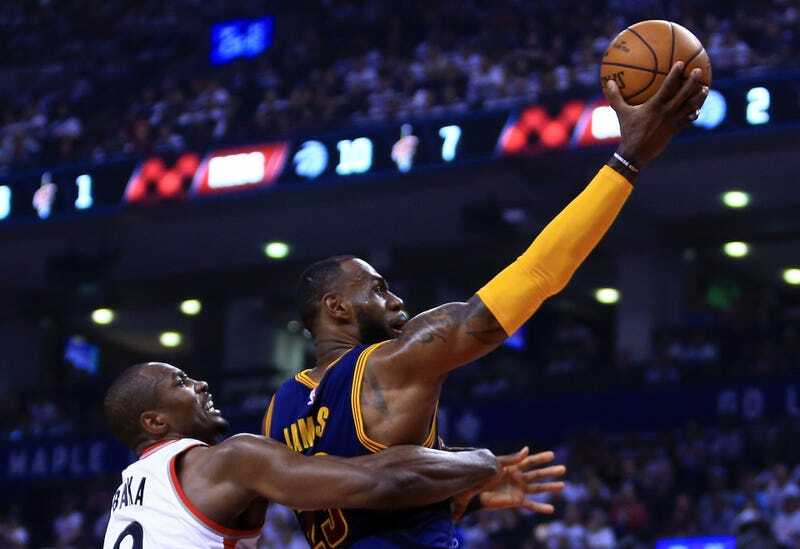 It's Probably Time To Stop Talking About "LeBron Stoppers"
The Toronto Raptors came into these playoffs with a well-known “LeBron Stopper” on the roster in DeMarre Carroll. The Hawks got swept by the Cavs when Carroll played the role for Atlanta in 2015, and James averaged 26.0 points, 8.5 rebounds, and 6.7 assists on 62.2 percent shooting when the Cavs beat Carroll’s Raptors in the Eastern Conference Finals last season. Tucker is a twitchy, nettling veteran, one of those defenders whose work is visible to the naked eye and almost exhausting just to watch. His hands are two gnats constantly circling his mark’s head, hands, and ball. He carries just enough meat on his bones to handle some abuse from a strong and fast cyborg like LeBron. He was acquired at the trade deadline basically for this explicit purpose. But the Raptors, somewhat confusingly, did not start Tucker on LeBron in any of these games, instead opting for DeMarre Carroll and Norm Powell. (Powell, who, complained that LeBron tried to “son him” by jerking his jersey to stop him from committing a violation, spent most of his minutes indeed getting sonned.) And so finally, with elimination just a game away, yesterday Tucker started and spent 46 minutes on one of the toughest defensive assignments in the history of sports. How did he fare? LeBron James had six turnovers. Tucker was involved in three of them: reaching around to swat the ball away while getting posted up hard; swatting the ball as James dribbled on the perimeter; getting beat on a drive, but still keeping enough of a hand up that James had to dump off a pass bad enough to get picked. These are not small feats! No one else on the Raptors seemed capable of causing LeBron even this much distress. He gets credit for making LeBron take 12 of his 22 shots from three. (James still made five of them.) He snatched a game-high 12 rebounds while doing LeBron duty. That’s pretty cool. Perhaps it is time to unbury the lede, though: LeBron James still scored 36 points, grabbed nine rebounds, handed out six assists, and shot 50 percent from the floor to close out this series. P.J. Tucker is at best a LeBron Inconveniencer, a LeBron Speed Bump, and he is no different from the brawny try-hards that have previously earned praise from fans and pundits who want to believe that determination and a set of broad shoulders qualify someone to bother LeBron James. Maybe, when you have a player who can perform every useful function on a basketball court, there is no sense in calling anyone at all his Stopper. Maybe we should just bask in his excellence and accept that no one utility player—and maybe nothing short of a historically good, well-manned, switch-everything defensive scheme— will do much to faze LeBron once he’s decided that he’d like to win a playoff series. If the Cavs make it to the Finals, we may once again be blessed with the opportunity to wonder whether Andre Iguodala—whose most recent attempts at LeBron Stopping resulted in James almost winning the Finals MVP award despite losing the series, and then orchestrating the greatest comeback in NBA Finals history—is still a LeBron Stopper.